My overview of the August 1914 scenarios continues! Here’s a look at some more scenarios, as the campaign progresses. With the Russians falling back after the morning actions, the Germans marched after them in pursuit. German troops faced no resistance when they entered Allenstein, while the Russian XIII Corps retreated to the south. Otto von Below of I Reserve Corps received orders to pursue them after army command had already sent his divisions south without his approval. "Just like a wargame," he muttered to his staff. Flushed with an easy victory, the Germans passed through Allenstein in parade formation and pressed southward after the Russian XIII Corps. The corps rear guard turned and fought with suicidal abandon, resisting until its ammunition was exhausted and then charging the Germans with bayonets. The sacrifice bought time for their divisions to rally, but time was running out for Second Army. Once again, the title made this a must-design scenario. A Russian rear guard is tasked with holding off an assault by a much larger German force, but the Germans are lower-morale reservists without a whole lot of artillery support. There are more Russian troops strung out along the road south of the initial battlefield who can be summoned to help out or left to hold the key road hexes. It’s an unusual situation that should challenge both players. Stationed in Warsaw during peacetime and thus spared most of the court ceremonial assigned to the Guard Corps, yet drawing on the pick of the officer corps and draft pool, the Russian 3rd Guards Division considered itself the best fighting division in the Imperial Army. Sent forward to shore up Second Army's crumbling left flank, the Keksgolmski Guards Regiment faced an entire German division by itself. The Guardsmen dug rifle pits and fox holes behind a thick cavalry screen, and awaited the Germans with professional indifference. For once, the Russian cavalry did its job, making it difficult for the Germans to approach the main line of resistance in an orderly fashion. When they did, they met a wall of rifle and machinegun fire that inflicted massive casualties at little loss to the Guardsmen. The Russian officers, using all the lessons won in 1904 and 1905 at such great cost, had laid out interlocking fields of fire and instilled strict fire discipline in their men. This one is very tough on the Germans – they have a good-sized force with good morale and artillery support, but they are facing the cream of the Russian Army. The Guards are dug in, they have sky-high morale and many more than the usual number of leaders. Somehow the Germans must force their way through. Thanks to the fierce rearguard action south of Allenstein, XIII Corps pulled away to the south in hopes of joining intact Russian formations still fighting the Germans. But reports came that the Germans were already across their retreat route. While that wasn't quite true, the Germans were very close. The Russians would have to turn and fight again. German troops of all three classes — regular, reservist and Landwehr — raced in pursuit of the defeated Russians, commandeering civilian transport to get to the battlefield that much faster. Russian XIII Corps command expected to have to fight their way through Hohenstein to join XV Corps, but managed to get there ahead of the Germans. With the enemy now close behind, the Russians put up furious resistance and German casualties piled up. The situation seemed well in hand until a battalion of heavy howitzers from the Königsberg garrison arrived along with the divisional artillery of two German divisions. The heaviest barrage of the war in the East to date broke the Russian lines, and the formerly organized retreat became a rout. 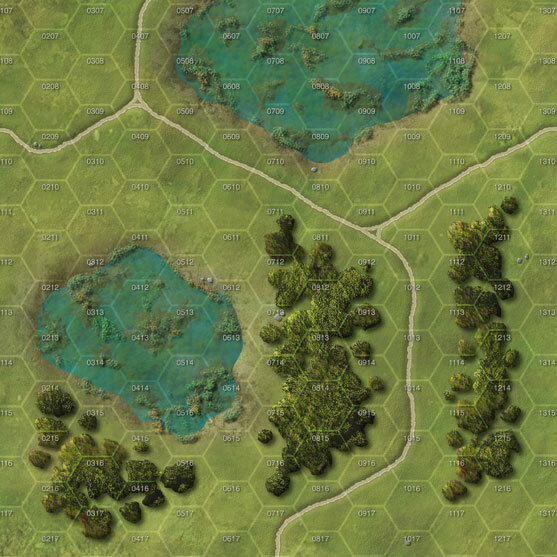 This is a huge scenario, with what seems like every infantry piece in the game in play on the board (not really, but pretty close) and all six maps in play. The Germans are trying to pursue the retreating Russians, while the Russian division on the board has to stop them from getting past. The Germans have plenty of artillery support, though their force’s quality varies from Landwehr to regular army. All of the Russian artillery is on the board, though it appears that no ammunition depletion number was included in development (let’s go with 10). As the German Eighth Army turned away from the Russian First Army to attack Second Army, the Russian General Staff ordered First Army to strike the exposed German rear. First Army lurched forward slowly, with only Lt. Gen. Vasili Iosivich Gurko's 1st Cavalry Division showing much aggression. 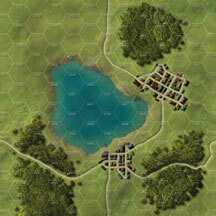 The advance reached the outskirts of Allenstein, where it reported stiff enemy resistance. Gurko claimed that his troopers sighted Allenstein, headquarters of the German Eighth Army, but lacked the strength to take it from the infantry that issued from the town to stop them. German accounts mention no such action, but do acknowledge that only the Russian cavalry made any attempt to bring aid from First Army to its beleaguered sister formation. After a deep-penetration raid through German territory, a Russian cavalry division comes upon a German town held by about a regiment’s worth of Landwehr. The Russians are worn out and have limited artillery support; the Germans aren’t very good but they are on the defensive. With Second Army disintegrating around him, its commander, Alexander Vasilievich Samsonov, ordered his last remaining intact force to march north to relieve the encirclement. XXIII Corps had the army's two best formations, and they still had the combat power to completely overturn the situation in East Prussia. A hastily summoned German force would have to hold off the relief effort or it might be the Germans offering up their swords instead of Samsonov's officers. Russian and German accounts of this battle differ somewhat; both agree that the Neidenburg garrison held the roads south of town for some hours before giving way before the Guards' attack. According to the Russian version, the Guardsmen took Neidenburg in the afternoon; the Germans claim that their men held out until well after darkness had fallen. Either way, the attack failed to rescue Second Army, as the formations trapped to the north of town could not coordinate their own efforts to break the somewhat disorganized cordon held by the German I Corps. The Russians are in a sticky situation, forced to attack northward along a pair of roads against a dug-in German force that’s initially pretty small but receives multiple waves of reinforcements. The Russians have a lone way to go – all six boards are in play, and the Russians have to force their way across all of them. But the Russians are the elite of the elite, and if anyone can execute this mission it’s the 3rd Guard Division. With the crossroads town of Ortelsburg back in German hands, Lt. Gen. Otto Hennig of the 35th Infantry Division determined that it would remain that way. When aerial spotting reports passed on word of a large Russian column approaching the town, Hennig took personal command of the small garrison and told them that he and his staff would fight alongside them to the last round. Meanwhile, the rest of his division wandered aimlessly through the woods to the south, bereft of direction. Hennig managed to find a pair of small reinforcing groups that helped hold off the Russian attack, but those additions only delayed the inevitable. Instead, German and Russian moves elsewhere saved the German general from his own stupidity. Just as the Russians were about to finish off the small German force, the Russian VI Corps received orders to pull back over the border into Russian Poland. Meanwhile, XVII Corps commander August von Mackensen, despairing of convincing Hennig to follow one of the corps' repeated direct orders to return to his post, finally ordered 35th Division's component units to march on Ortelsburg and retrieve their commander. The Russians have overwhelming numerical superiority in this one-board scenario, but they have to take every town hex. While casualties play no direct role in the victory conditions, in practical terms that means they’ll have to wipe out the German defenders (which is possible – there aren’t that many of them even though they have better morale and heavier artillery. Emboldened by First Army's seeming inability to mount a serious assault against the outmoded Fort Boyen, the small garrison took the fight to the Russians. Informed that the fort would form a jumping-off point for the German Eighth Army's planned offensive against First Army, on his own initiative the garrison commander, Col. Busse, gathered his mobile forces and set out to widen the bridgehead for this future operation. The sheer, unbridled idiocy of Busse's attack took the Russians by surprise, and the Landwehr somehow managed to push them back several kilometers from Fort Boyen. Over the coming days regular troops from XVII Corps would pass into the zone cleared by this impetuous attack. But the Landwehr failed to advance to the trench lines the Russians had been digging for days; the regulars would still face a serious challenge in breaking out of the L�tzen Gap. The German player has surprise on his side in this scenario and, well, not much else. At least his threshold for victory isn’t too onerous, or wouldn’t be if his troops just weren’t so bad. It’s an interesting little scenario, with the better force son the defensive and the poor-quality Landwehr having to attack with the help of a slight numerical advantage and not much else. Following the defeat of the Russian Second Army at Tannenberg, the German Eighth Army turned its attention back to the First Army. Reinforced with two corps and an independent division from the Western Front, Hindenburg rushed his troops eastward to push the Russians off every inch of German soil rather than strike south to finish off Second Army. But the Russians had brought forward reinforcements of their own, with the new Tenth Army taking the field south of First Army's lines. As the vanguard of III Siberian Corps and Tenth Army, the Finnish riflemen had been expected to hold their ground to allow those formations to deploy in front of the German advance. But the German Landwehr, gaining great confidence after their successes at Tannenberg, would not be denied. They pushed the troops many considered the Russian Army's best regular infantry out of the town of Bialla, beginning what would be known as the First Battle of the Masurian Lakes. The conclusion probably should have noted that the “Finnish” troops were not Finns, but long-service Russian regulars stationed in Finland. Finns were exempt from conscription under the Russian Empire, though they could and did volunteer for service. In this scenario, the Finnish Rifles must hold against attacking Landwehr, who are very well-led and have serious numbers, but not a whole lot of other advantages. And that wraps this segment of our scenario overview. We’ll conclude it next time, and then prepare for more Infantry Attacks adventures. Infantry Attacks: August 1914 is in stock, so order your copy NOW!